Belleville was made famous through modern designs of their black combat boots, now primarily used by Navy and Coast Guard personnel They offer both hot and cold weather versions with a host of different options. The entry level Belleville 700 features a Vibram outsole, smooth leather and steel toe protection. The 700 is a cold weather model that adds Gore-Tex technology to keep your feet dry. The 700 ST is the steel toe version of the 700. 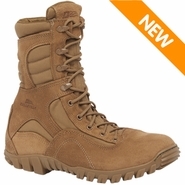 The 770 is waterproof and insulated with 200 grams of Thinsulate insulation. 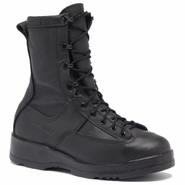 The 800 ST is a boot designed for use on Navy flight decks and has a Vibram sole pattern designed specifically to minimize foreign object debris (FOD). The 880 ST adds Thinsulate insulation in addition to being flight deck ready. The 330 ST is a brown Navy flight boot designed for cold and wet weather.